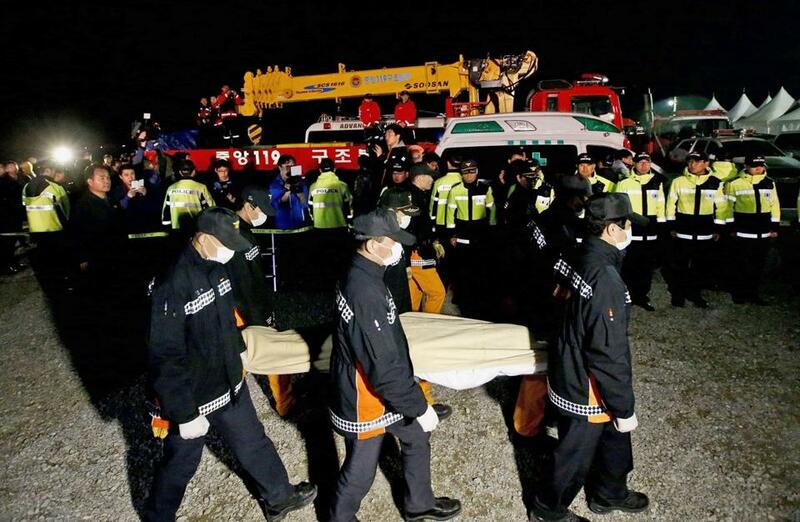 South Korean rescue workers carried the body of a victim of the ferry sinking as the search for survivors continued. JINDO, South Korea — A 26-year-old third mate was steering a South Korean ferry through a notoriously treacherous waterway for the first time when it tilted and sank, prosecutors said Saturday, as rescuers raced to find any survivors among the more than 260 missing, many of them believed to have been trapped inside the capsized vessel. Questions about the qualifications of the third mate, Park Han-gyeol, mounted Saturday after investigators revealed that the ship’s captain, Lee Jun-seok, 69, was in his quarters, leaving Park in charge of the bridge when the ferry was negotiating the waterway 11 miles from Jindo Island. The number of confirmed dead rose to 46 on Sunday after 13 more bodies were found, disaster officials said. Divers broke a window in the submerged vessel and initially removed three bodies late on Saturday, the Associated Press reported. On Sunday, the government said 10 more bodies had been found. For decades, the 3.7-mile-long, 2.8-mile-wide Maenggol Waterway has provided a shortcut for ships that try to save fuel or time navigating waters dotted with islets off the southwestern tip of the Korean Peninsula. But the channel also has a reputation for having one of the most rapid and unpredictable currents around the peninsula. Investigators said they are looking at whether the third mate ordered a turn that was so sharp that it caused the vessel to list. Park ended up in command of the ship by chance. The three regular mates on the 6,825-ton car ferry, the Sewol, worked on a fixed rotation of four-hour shifts, with Park on duty at the bridge from 8 a.m. to noon. The ship had been scheduled to leave Incheon, a port west of Seoul, at 6:30 p.m. Tuesday with 476 people on board, including 325 second-year high school students headed for a field trip on the southern island of Jeju. Park had been working aboard the ferry on the Incheon-Jeju route for six months. But the ship’s departure was delayed 2½ hours because of heavy fog. Had it left on time, the ship would have passed the spot where it foundered and sank half an hour before Park’s shift was to have started. Park was unavailable for comment. She was arrested Saturday, along with the captain and a helmsman who was also on duty with Park. They could face criminal charges of abandoning their ship and passengers during a crisis, accidental homicide, or both. The factors that led to Park’s being in charge while the ferry plied the Maenggol Waterway may provide another piece of the puzzle investigators are putting together. Ever since the ship capsized Wednesday morning, investigators have worked to unravel the mysteries surrounding one of South Korea’s worst peacetime disasters, especially the question of why the ship suddenly tilted on a curve in the shipping lane. On Saturday, navy divers struggled to enter the ship for a fourth straight day. Many of the survivors have said a large number of passengers were probably trapped inside the overturned and sunken ship, partly because they had been advised by the ship’s crew to stay put even while the ship was tilting dangerously. “The chances of anyone surviving in there depend on many factors, such as the water temperature and individual conditions,” said Ko Myong-seok, a senior coast guard officer involved in rescue operations. But several days after the ship capsized, hopes have dwindled. All the 174 survivors were found in the immediate hours after the ship’s sinking. Divers fighting strong currents and rain have been unable to get at most of the bodies believed to be inside the ferry, and officials said Saturday that the recovery operation could take weeks. Divers looking for bodies or passengers who might be still alive in air pockets have also been thwarted by poor visibility. Even when they were able to enter the ship, they soon had to retreat, with their way blocked by debris. Through a window, divers saw three bodies in life jackets floating inside Saturday, coast guard officials said at a briefing, and broke through a window to recover them. They were the first bodies recovered from the ship. On Saturday night, flares illuminated the murky waters as divers plunged into the night sea to try again to get inside the ship. To help, officials brought in nine squid-fishing boats, which have powerful lights used to lure squid at night.